Miami is already known as one of the more popular destinations for vacationing Brazilians. This summer, however, Brazil isn’t just sending beachgoers to South Florida. Last month, FIU welcomed 50 Brazilian public high school English teachers to the university for the PDPI project, translated in English as the Professional Development Program for Teachers of English, which is sponsored by the Brazilian government through the Institute of International Education (IIE). The teachers in the program will be provided with 180 hours of classes and labs while being taught different teaching methods at the FIU College of Education. At the same time, they will participate in an intensive English language instruction provided by the English Language Institute (ELI). The students had to go through a competitive process in order to qualify and many had to leave their families back home in order to participate in the six-week summer program. But for those who decided to come, the wealth of knowledge and training combined with a chance to engage in American culture has proven invaluable. 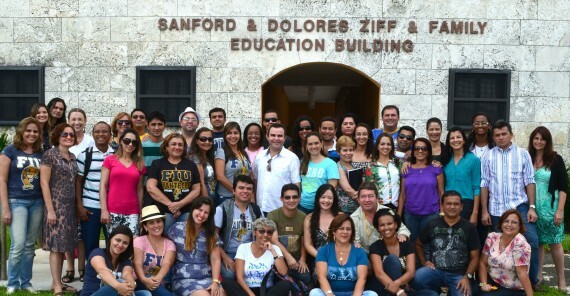 PDPI students from Brazil in front of the Ziff Education Building, where they take classes for pedagogy. A typical day in the life of these students, who are living in residential halls at Modesto A. Maidique Campus, includes mornings at the ELI and classes with faculty under the direction of ELI director Luis Sanchez designed to sharpen the group’s English skills. In the first few weeks, the group is being taught conversational skills and pronunciation. In the final weeks, they will get a chance to integrate with other students at the ELI and get a first-hand look at how those students learn English. The College of Education then takes the group for the afternoon and focuses on training them on methodologies, such as fostering classroom participation and effective student assessment and evaluation. The program also goes beyond the classroom. Maina Silva, 36, and her colleagues got to experience a bit of what life is like in Miami and the United States, visiting many of the city’s landmarks, enjoying an Independence Day fireworks celebration at the Biltmore Hotel, taking the Wynwood art gallery tour and going on an Everglades excursion. Toward the end of the program, the students will have to teach English lesson based on what they’ve learned and participate in a service learning project at a local high school, giving something back to the community they’ve called home for six weeks. These 50 teachers are just a few of the students who have been sent from the rapidly growing South American nation to different parts of the United States for the summer, but Miami has a unique connection and appeal to Brazil. Brazil is Florida’s top trading partner, totally $19.6 billion in trade in 2012, and programs like this show the Brazilian government’s eagerness to improve relations between the two countries as Brazil attempts to grow its emerging economy in the global marketplace. A second group from Brazil may be coming to campus in January of 2014. FIU is working on a proposal to host more students for the program. There is also potential for other countries to get involved; Saudi Arabia, Turkey and Japan have shown interest in starting similar programs. Welcome to the Magioc City. Please feel like at home. But let me know a little more about Paulo Freire. It has been a rich experience. We will certainly be better prepared to share knowledge and experience in our schools in Brazil. Florida International University and more specifically College of education and English language Institute have contributed hard to this. We are very happy here at Florida International University – FIU, because we have a very competent and experienced Adviser, so we are so thankful to Doctor Teresa Lucas. it has been good days! IT HAS BEEN AN EXPERIENCE THAT I JUST CANNOT TAKE IT FOR GRANTED! NEVER HAD I THOUGHT IT WOULD BE POSSIBLE TO BE HERE THIS WAY. IT WILL CERTAINLY BROADEN MY HORIZONS. I am a teacher of English in Brazil, from the state of Alagoas, northeastern Brazil, one of the most beautiful states in our country, and I am participating in this same program held in Miami. We are over 50 English language teachers Improving our English to be able to contribute to our work in the classroom in a significant improvement of teaching and learning programs of our students concerning the English. We are in Orlando, in the University of Central Florida, under the tutelage of Doctor Tom Owens, practicing the English language in the classroom, on the streets, with other students from different countries, in different situations, all of us eager to improve each increasing our educational practice and our fluency that this is the language most spoken in the world. This experience is the realization of the vast majority of us who never leave our country to an experience of that kind. We were very well received by everyone here in Orlando. We are studying new methodologies in teaching English language, new techniques in how to teach English, new conceptions of teaching and learning as well as better understanding the notions always valid in the area of literacy. The Brazilian government has long strived to provide all Brazilian teachers new opportunities to acquire knowledge in various area in which they operate.It is the Brazilian government effort to produce the best possible background for educators searching to transform Brazil into a power also educational in a few years, because it recognizes that without education valued and enhanced through those who already dominate the technologies necessary for this goal, we will not be able to overcome the urgent demands of progress and widespread growth by passing our great country. We are here to learn and to exchange experiences. U.S. and Brazilian governments station this partnership already for some time, exchanging information that make growing knowledge between the two countries, and improving the quality of education of both peoples. It is to be a very enriching experience for all of us. Thank Brazil and the United States for this opportunity! Wonderful! I did study some Portuguese as a graduate student at FIU, it is an incredible university with a beautiful campus. I am very interested in teaching music in Brasil. Best wishes for your continued success! It is wonderful to see opportunities as well as cultural sharing taking place between Brasil and USA. Muito prazer! This is really a big opportunity to all the teachers. culture immersion and scenario based learning?